"So Good we took Two trips!" 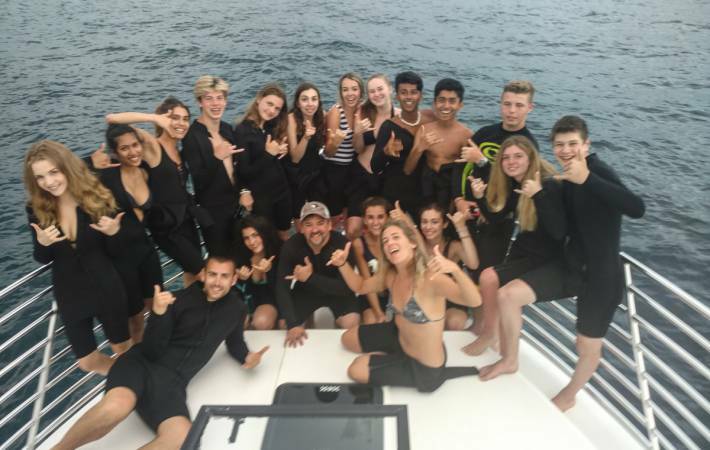 "Had an absolute blast with Manta Adventures!" MANTA RAYS! Majestic Sunsets and Assorted Ocean Life. "Loved this company, amazing staff!" If you have NO swimming or in water experience book as an OBSERVER. The MANTA show is visible from the boat. You can enjoy the experience along with your family and friends. 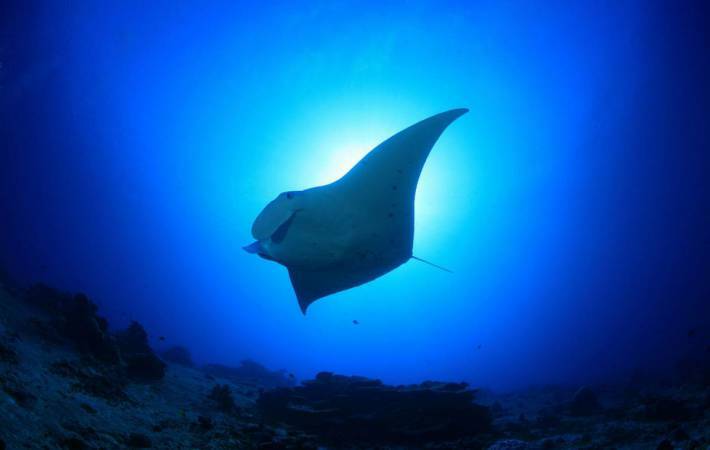 Offshore of Kailua-Kona, Hawaii Big Island, our visitors have the rare treat to experience – the Manta Night Snorkel. Mantas come to feed on an accumulation of plankton off the shoreline. The mantas glide through the water like birds feeding on the plankton. 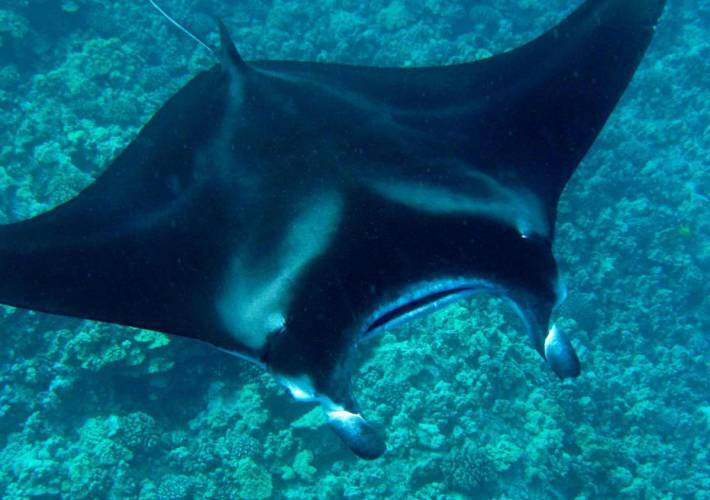 The Kona mantas are gentle giants, in many instances are 16 feet from wing to wing. The experience of seeing these massive gentle creatures in the wild is exhilarating and makes for an incredible Night Manta Snorkel show. The Manta Night Snorkel is an experience you have to see for yourself. We treat the Kona mantas and all of the Big Island ocean environment with respect. We are careful not disturbing these gentle giants in their habitat. Its a privilege for us to take you on this trip and we do not take it for granted. 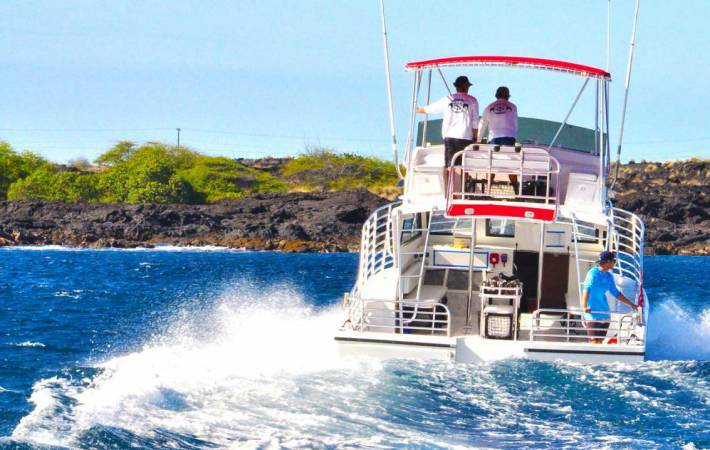 Our boat was specifically designed for the Kona Night Snorkel tour and is fantastic for all guests. Mantas can be viewed from the boat (ride alongs) or in the water (manta snorkel). SNORKELER POSITION: Snorkelers must stay on the surface and keep legs horizontal. Do not dive down into the water column. This is prohibited. LIGHTS: Snorkelers please shine all lights down. TAKING PHOTOS or VIDEO: When taking underwater photos or video please be considerate of people and the mantas. 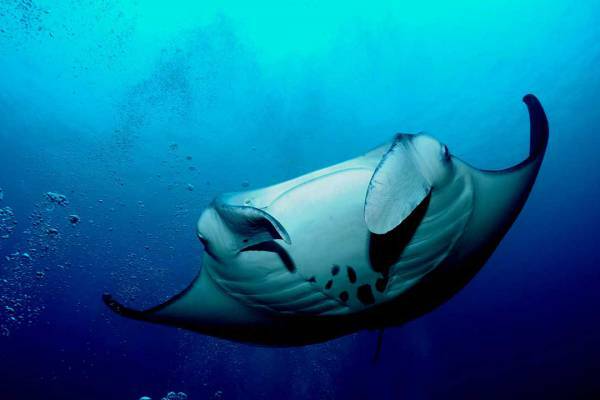 Minimize your equipment in the water column and let the mantas come to you. The flash must be in off position when taking any manta picture or video. These guidelines were established by manta operators in Kona, Hawaii.